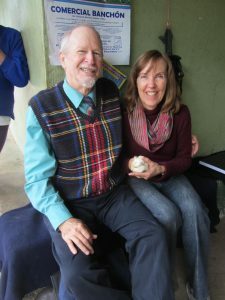 The author, Cheryl, and her husband, John, are among the latest wave of North Americans immigrating to Cuenca to *retire,* having arrived in June of 2016. Cheryl’s checkered past includes the anthropology of Ecuador, concrete carpentry in Chicago, and home inspection and energy audit businesses. John’s background in economics and architecture lead to a singular focus on energy efficiency in buildings for 40 years, also in Chicago. When John and Cheryl met and eventually married, they created a mini-Brady Bunch: Cheryl’s daughter and John’s son each gained an adult sibling. With the sale of a business (www.ezing.pro), home, furniture, and cars; and with few responsibilities Cheryl and John find themselves free to follow their interests in Cuenca and Ecuador. They are reveling in this new found ease of life and freedom to follow our passions! John, the man with singular focus, is admirably following his interests in sustainability in urban development despite the language challenges. Cuenca architects have been open to his overtures of collaboration. Cheryl seems not to have quite found her mooring but thinks revisiting the anthropology of Ecuador, sharing experiences as immigrants (aka expats) to Ecuador, and blogging will be fun and rewarding.